“Red Tape Reduction Task Force” of 2001 to recommend priorities for the elimination of regulations in BC. Rich Coleman’s 2002 announcement that red tape had been slashed by 41 per cent. Alberta Premier Ralph Klein’s announcement in 2004 that he and Campbell had been working together to cut red tape. Energy Minister Richard Neufeld’s 2007 announcement that Liberals had slashed red tape for entrepreneurs in BC. Small Business Minister Rick Thorpe’s introduction of “BizPaL” a tool to cut red tape to make this Canada’s most business-friendly jurisdiction. The mantra about cutting red tape will be repeated forever and it seems relatively harmless. No one wants unnecessary barriers placed by government before any activity, except initiatives that might harm persons or property. If someone wants to build a chemical factory upstream of my house, I sure as hell want a great number of meaningful routines confronting them before they proceed. Christy Clark’s mentor Gwyn Morgan and the oil billionaires want no barriers or red tape preventing them from putting oil and gas pipelines between Kitimat and the Alberta tar sands. Most British Columbians would disagree. 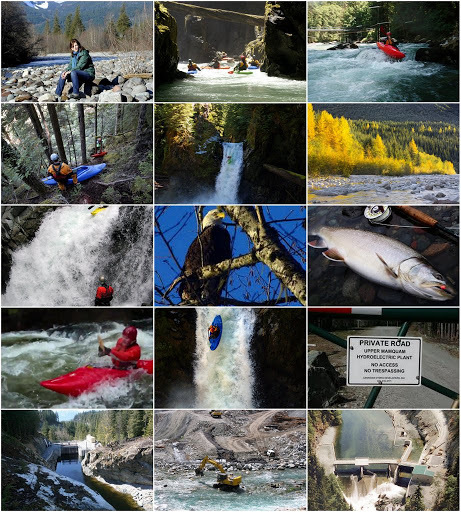 “The Mamquam River pours cold and fresh off the Coast Mountains, forming pools and canyons and chutes of white water on its way to the Squamish River and Howe Sound. “It was a natural place for federal fisheries biologists to assemble on an August 2010 weekend for swift-water safety training. Like the river itself, however, their exercise took an expected turn. “Rather than watch the Mamquam flow predictably to the sea, the biologists were dismayed to witness the water levels fluctuate wildly — and with dire consequences. “Young steelhead were dying, stranded without water. “The culprit? The Capital Power run-of-river hydro plant, located just upstream. “The independent power industry bills itself as green, sustainable and environmentally responsible. Another case involving “Ruin of the River” power generation, mostly for the benefit of investors outside BC, is covered by Rafe Mair in Tell DFO to Save Kokish River Steelhead from Proposed Private Power Project. Looks like some more changes to favor those that would restrict access to the public on industrial roads in the Occupier's Liability Act. The press release implies that fewer roads may be closed but access may be restricted for use other than its “primary use”. Smells like further effort to keep the public out of the bush. For their own safety of course. Of course the public must resume it's responsability to maintain and improve these roadways as required. That of course is expected. Any less would contrevene these companies constitutional rights. After catching up on five days of missed “Northern Insights”, I am more impressed than ever by the effort you are putting into providing us readers with a different insight into the things that affect our way of life. Keep on keepin'on, Norm. One day your expose's will have a positive effect on the way we are governed. All British Columbians owe you a big THANK YOU. Fair comment about the graphs. I would love to hear Christy answer questions regarding stuff like this. I would lovet to hear her raked over the coals and stumble through answers. Side note: Am I the only one who watches the West Block every weekend only to get frustrated by the 5 minute segments?? How bad could I get grilled in 5 minutes? I guess that is how he gets so many big names on there! Everything had to be set up, with easier access to thieve from the province and the people. Campbell lied for his election win, the BCR wasn't for sale. He then shifted his own theft off onto the two patsies, Basi and Virk. Documents show, Campbell bossed his theft and corrupt sale of the BCR, right to the bitter end. The priceless Real Estate that went with the BCR, thieved and gone, for Campbell's business buddies. Campbell thieved and sold our rivers. Very evil, terrible eco disasters by Campbell and his buddies, again, loading up Campbell's wallet. Campbell shipped our mills to China, along with our raw logs. He put 131,000 BC mill people out of jobs. Campbell also gave China, our BC mines. China is bringing their own people over to work, our BC mines. Harper and Campbell's permission for the filthy diseased fish farms, another horrific eco disaster, killing off the wild Salmon. I too heard the Kokish River is next for destruction. The prime ALR, has been thieved, to build malls and urban sprawl. The site C dam, flooding the most valuable farmland in BC, for fracking. The clean underground water, is poisoned for miles, from this idiotic practice. We can light the water on fire, coming out of our faucets. Campbell had to set up the Enbridge pipeline and the filthy oil tankers with Klein, for oilman Harper. Campbell was rewarded, the High Commissioner post to England, for doing Harper's dirty work for him. Campbell and his thieving ministers, wasted our tax dollars on a scale, never to be seen in BC's history, until Campbell's thefts. Campbell's second election lie, the HST wasn't on his and Hansen's radar. Hansen caught in a lie, finally had to admit the HST was on his, Campbell and Harper's radar, long before the BC election. Now the BC people have to pay Harper for stealing the, illegal HST from us. Harper was drooling at the mouth for BC's HST so badly…Campbell wouldn't even permit a full debate in the Legislature. The Campbell/Clark BC Liberals, have wasted millions of our tax dollars, on wine, food, just have a look at Laila's site. Chomp, chomp Chong, has added extremely high wine costs, to go along with her fine dining. Hold your noses while you read about, this thieving of our money. Even tax dollars thieved for nail salons. Boessenkool, is selling off what is left of BC's buildings and Real Estate. He and Christy have set up the HST, to be paid back by the next party. BC is totally gone, everything has been thieved by, Harper and the Campbell/Clark BC Liberals, Boessenkool is destroying all the rest of BC. When we get rid of the evil BC Liberals. We have to take our province back, and then separate from the rest of Canada. Harper had better bring the g.d. army with him, to force the Enbridge pipeline and the filthy oil tankers on BC. Mind you, it isn't the first time Harper has had the police, cause trouble in peaceful demonstrations. Severely injuring innocent Canadians. Even a man with a prosthetic leg, was dragged by his neck, to one of Harper's previously set up, little stalags. But, but, but…….don't you remember the grim nineties? I had forgotten but Queen Christy reminded me during her sickening video op yesterday on the West Block (the good part of seeing her on that show was being reminded that at least for the moment she was in a different province than me). The NDP during the nineties didn't manage to destroy the forest industry in spite of that being a period of depressed resource prices. Campbell's liberals managed to almost make the forest industry extinct during the biggest building boom in US history.